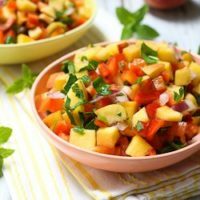 This juicy peach salsa tastes great with grilled chicken and you can also serve it with meat and fish. 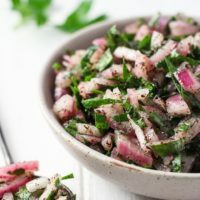 It will also add some wonderful flavor to wraps and sandwiches. It’s August and this means peaches are in season here in Ontario. You can buy them everywhere and they are super cheap – just a few dollars for a box full of beautiful delicious fruit. Peaches are full of wonderful healthy nutrients. Peaches contain salicylates, the same compounds used to make aspirin. 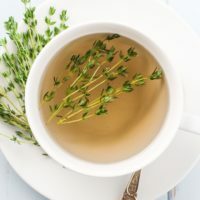 Researchers believe that these compounds may discourage blood clots from forming. If you bought peaches and they are not fully ripe, don’t worry. Just keep them on the kitchen counter away from direct sunlight and they will ripen very quickly. Make sure to store ripe peaches in the fridge as they go bad quite fast. Peaches have a low glycemic index of 30 which makes them a perfect fruit for those watching their blood sugar. With all the abundance of peaches around us, it’s the perfect time to freeze some peach slices for the upcoming winter season. 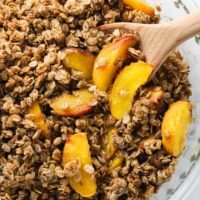 Just wash and slice peaches; then spread them over a baking sheet covered with parchment paper. Place them in the freezer for a few hours until the peach slices are frozen. Transfer to a plastic bag and enjoy all winter long. 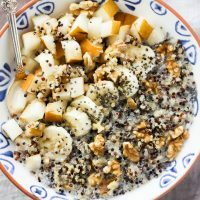 Are you out of ideas on how to use peaches? 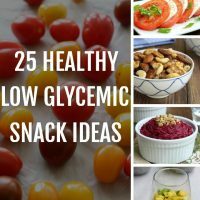 Try them in salads and/or salsas. 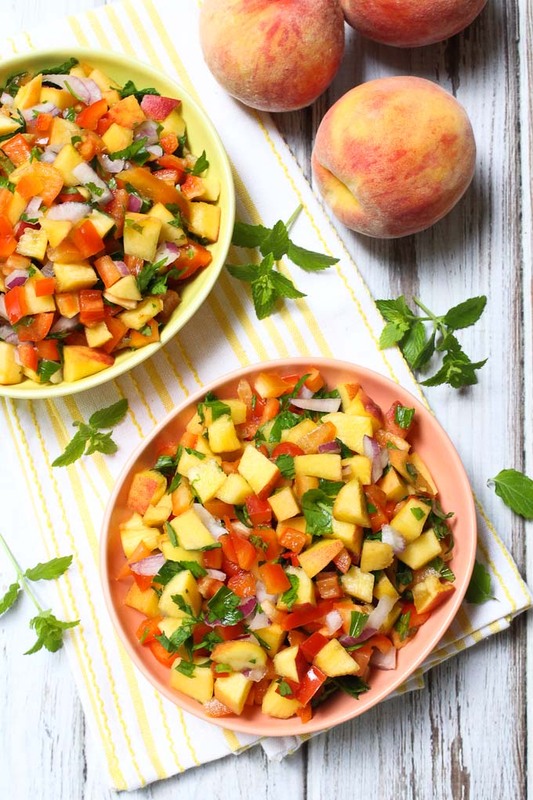 Today’s peach salsa recipe will help you start using peaches in a slightly different way. 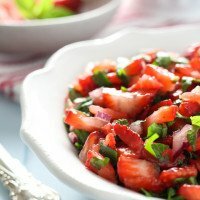 If you are looking for more fun appetizers and condiments, check out this Strawberry Salsa or learn How to Make Sumac Onions. 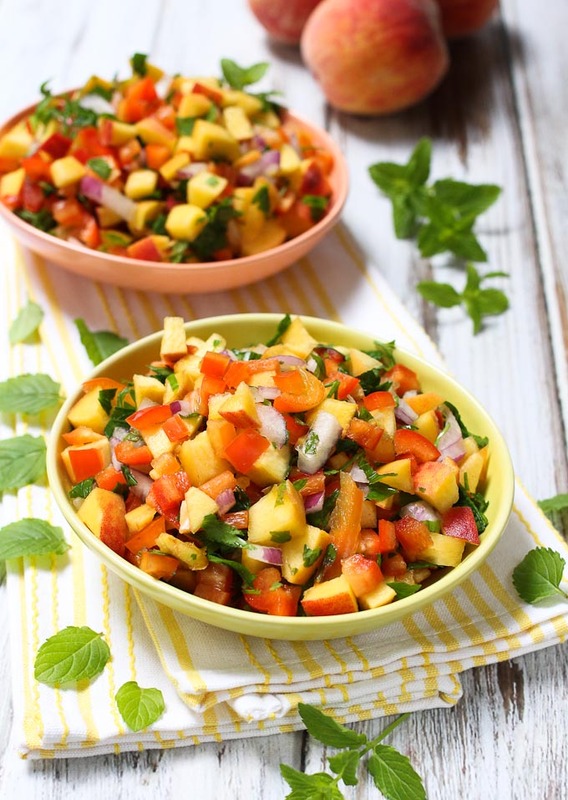 A very easy Peach Salsa recipe. 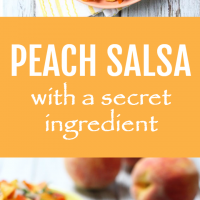 Peaches taste great in salads and salsas too and this recipe will help you start using peaches in a slightly different way. 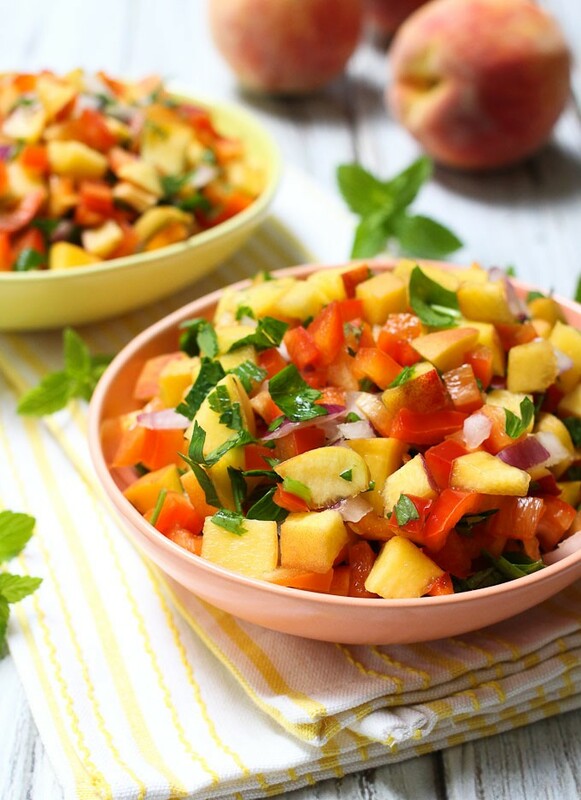 Place the peaches, onion, red bell pepper, parsley and mint into a salad bowl. In a separate small bowl, mix together the grated ginger, olive oil, lemon juice and salt (if using). Pour the dressing over the peaches mixture and toss to combine. 1. 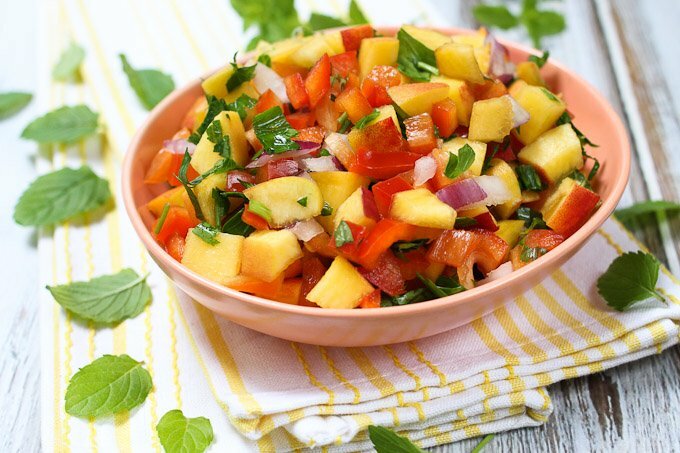 Keep in the fridge for up to 48 hours in a glass container with a tight lid. 2. Nutrition information is a rough estimate for 1 of 6 servings.